2014 is already proving to be a year jammed-full of WW1 commemoration, but for us, it is important to move away from cenotaphs, poppies, and the imagery we associate with war memorials. Our project invites everyone to step back, take a few private moments to think, and make their own contribution. If you could say what you want to say about that war, with all we’ve learned since 1914, with all your own experience of life and death to hand, what would you say? If you were now able to write to the unknown soldier, a man who served and was killed during World War One, what would you write? We’ve asked some well-known writers to contribute, and we’re delighted that people like Stephen Fry and Malorie Blackman, Andrew Motion and Val McDermid have agreed to join in. And we’re equally pleased that school children, pensioners, students, nurses and firemen are planning to lend their voices to this UK-wide artwork. Letters can be submitted now and will be published here starting on 28 June – a hundred years to the day since the assassination of Archduke Ferdinand which marked the beginning of Europe’s descent into war. The website will remain open until the night of 4 August, the centenary of the outbreak of war. Eventually the British Library will archive all the letters in their collection. Please add your voice. What you write will help provide a snapshot of what people in this country are thinking and feeling in this centenary year. 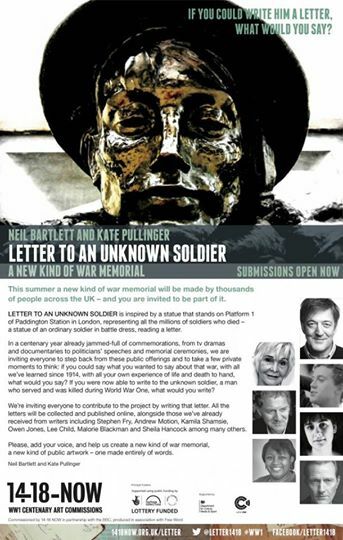 Your letter will help us create a new kind of war memorial – one made entirely of words, and created by everyone. But we hope you might like to write a letter to someone from St Mary Bourne, either a real ancestor who took part in the war, or simply one of the people of St Mary Bourne who fought to defend our village and nation. Although the 14-18 website is only asking for letters to those who were killed, I think it would be in keeping with our site to invite you to write to anyone who took part. We are strangers to each other. All I know is that you came from the village that I now live in and have learnt to call home. But it is difficult to write to you without giving you a name. It is now nearly a hundred years since you gave your life in the Great War. You were told that you were fighting for King and Country but I feel it was more personal than that – you were fighting for your family and your friends; the fields and the Bourne Rivulet; the cows and the sheep; and the downland that surrounds us. You were fighting to defend the land of your fathers, who have lived in this valley for generations and worshipped at the church since the 12th century. And you were fighting to defend our way of life, where an Englishman’s home is his castle and his rights were enshrined in Magna Carta. These are noble ideals, and this is a land worth fighting for. But it is easy for me to say this as I have not been put to the test, as you were. This is above all a thank-you letter, I wanted you to know how deeply grateful we are for your sacrifice. That looks platitudinous, but it is nevertheless deeply felt – our lives would have been completely different had we lost the war. Generations to come in St Mary Bourne will be grateful to you, as we are to those who lived through the war and whose only wounds were on the inside. I am more sorry than I can express that the personal cost you had to bear was so great. We shall never forget the sacrifice made by you and your comrades. The fragility of life is always with us and as you grow older you appreciate it more. Unknown Soldier, you didn’t have the chance to grow old but ensured we had the opportunity. Thank-you. One hundred years is, for most, more than a lifetime and we who live in 2014 have pledged responsibility never to forget in memory of you. We will proudly commemorate your life, tell our children that future war is futile and pray for a world that lives with respect and peace in its communities for evermore. Our beautiful son is fourteen years old on 17th August 2014, and had he lived in your time would probably have gone to war; a poignant thought for us. We shed tears when we really thought about the possible implications of that…we are entirely grateful that he doesn’t have to. We recognise you may not have had the choice. Hindsight is remarkable…but we hope for a more remarkable foresight in our future. I think that is a lovely letter – foresight indeed! I wonder whether we would have gone into Iraq and Afghanistan if we had had 20-20 foresight? I really just wanted to drop you a short line – I have walked past your statue in Paddington station several times and really not thought about the sacrifice you and thousands of others gave for all of us – we may never know your names and may never be able to picture you as you were but be sure we are truly grateful for the sacrifice you gave which was the biggest one of all – your life. I feel sure you went off to War thinking you would be home soon all in one piece having “done your job” – never dreaming there was a chance you might not return. War is a dreadful thing and I cannot imagine the horrors you went through – I have read things and seen films but to actually live through those horrors is unimaginable to me. I know I am always moved by the memorials to so many of you “Unknowns” – I feel that is such a sad term – you were real, you had a family, friends, you lived in a community – just as I do and I cannot imagine been remembered as unknown. So please take this letter as a thank-you to you and all your comrades for your bravery and sense of duty which has given me, my family and all those I love and are dear to me the freedom we now enjoy. I thank you on behalf of the ‘unknown’ but very real soldier, Sandra. It seems strange to be writing to you as you have never been away from the family home or the village since you were born. I know that you are excited to be travelling abroad as a young soldier to do your bit, but please be a good boy and obey the sergeant who, I am sure, will do his best to keep you safe. Your Pa and I were so proud as we watched you and your pals, gathering in the village square waiting for the truck to take you to the station. Your little brother Willy asks if the steam train was very fast. I hope you and your friends will be kept together as, to have a friend nearby when you are in foreign parts, may make your time away more bearable. I am sending you some socks I have knitted to keep you warm on colder nights. Please write when you can, tell us about the countryside, is it the same as home? Let us know that you are safe. Be sure that your Pa, your sisters and little brother and I pray for your safe return every night. We read that the war may be over by Christmas – I wish with all my heart that it had never started and that you were safe here at home – but if this is true what a party we shall have in the village when you all return safely. Until then God Bless and keep you safe. X a big kiss from your sisters. What an immensely cheering letter! I hope that many sons received just such a letter from their mothers. In fact I think they must have done, how else were they able to withstand such long periods at the front? Thank-you so much for sharing it with us. To become a man and save your land. Unable to talk, to sing, to smoke. And for using your life in order to save us. Thank-you very much for this Lindy. It is interesting, isn’t it, how poetry encapsulates, sometimes in a very few words, so much thought and feeling.